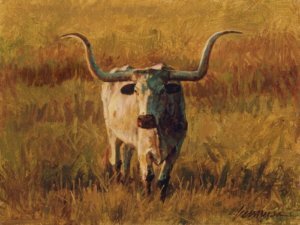 Texas artist Ragan Gennusa is known best for his dramatic portrayals of longhorns. A former Texas Longhorn football player, it is a subject he knows well and one that is close to his heart. "Late Light" radiates with intense afternoon sunlight.